Legalization for me as an avid cannabis buyer and consumer meant that all the info I wanted to know but knew not to ask was finally going to be available! Many questions hit me all at once! · Who are these guys that have been growing cannabis undercover for so long? · What kind of variety of cannabis genetics will stand out from the rest? · Will any one particular region of Washington become the premier cannabis growing region? · How will the final products of the same strains vary by region, or will they? · How big can cannabis plants get with no fear of government helicopter spotters and raids? · What are (if any) the parallels with grape growing areas and future cannabis grow operations? That’s really what got me the most fired up about entering the industry. I wanted to create something for people like me- a shop that sourced rare, unique, & authentic genetics that could provide a buyer will all the backstory on that bud! That and my dream of opening an Amsterdam café was enough motivation to tenaciously get The Novel Tree up and running in 2014. 2015 was really the year of the first Washington sungrown harvest. Sure, there was some outdoor pot in 2014, but due to the timing of the WSLCB rollout- the season was rushed because no one got licensed in time to grow a full season. True to our original vision, we partnered up with a number of under the radar grow operations that in our opinion grew much better cannabis than the “top marketing companies that happen to grow weed” that I won’t name but you won’t find on our shelves. To us, Authenticity and Diversity are King and Queen. Kiona Tropical and Heirloom Cannabis was one of the first outdoor farms we identified as this royalty! 2015 harvest season was the first experiment of an outdoor harvest with max potential. Interestingly enough, we found that the more rare and unknown genetics weren’t quite catching on as much as we anticipated- most cannabis customers were also being hit with a flood of new knowledge and weren’t quite ready to step away from the widely known strains like Blue Dream, Girl Scout Cookies, Green Crack, etc. Kiona THC had a very strong following with The Novel Tree team and scored consistently high marks on our in-house product review forms. Although there existed a very passionate group of Kiona THC customers, many of our customers were just not quite ready for it. 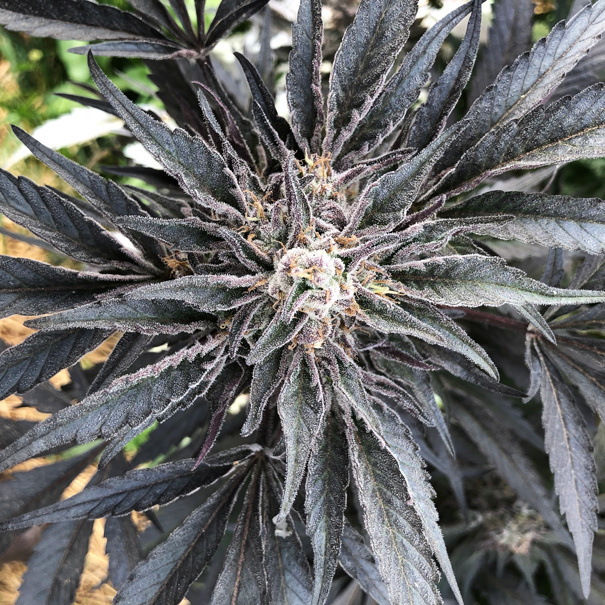 Kiona THC’s operation is like the wisdom of Albert Einstein, “The more I learn, the more I realize how much I don’t know.” Admittedly, it is a TON to learn however in this setting it is awesome! I get it- the true Sativas don’t have much jar appeal, but for those that can look past the appearance will get a much richer and truly unique experience. It is a lot of information to deliver and to be absorbed because the question, “What makes Kiona special?”, could be discussed for hours in very fine detail. The short version answer is still lengthy: “Kiona Tropical & Heirloom Cannabis is located in one of the best growing regions of the state. They use permaculture and organic growing practices for their legitimately unique heirloom cannabis strains that have been directly sourced from around the world prior to licensing. They practice a long & slow cold cure for all their cannabis flower that is then packaged in glass jars with Bovedas to keep the humidity in the sweet spot and the lid is then sealed with wax to ensure the jars are air-tight. Oh, did I mention they’re what we consider a top-shelf product for a mid-grade price? Also, those Sativas get as many weeks to mature as they need where most indoor grows do not have the ceiling heights to grow 10+ foot tall beauties.” Woof- it can be a lot to take in especially for someone new to cannabis. Plus, if you’re really new to the experience of “being high” or simply looking for the “typical heavy stone” you may not notice how different of an effect these strains can have. In early October 2018, we set out to Benton City to test our principles and learn from the team at Kiona. Our first stop was in Prosser, at the Walter Clore Wine & Culinary Center (https://www.theclorecenter.org/) to learn a bit more about the Washington wine industry, specifically how it might relate to cannabis growing. Scott, one of the co-founders of Kiona THC, met us there to help connect the dots between the wine and cannabis cross-over. Kiona Tropical and Heirloom Cannabis is located on Red Mountain, an American Viniculture Area (AVA) established in 2001. Red Mountain is about 4,500 acres on the Eastern edge of the Yakima Valley, while not really a mountain and more gold than red. It is distinct enough to be the smallest AVA in Washington and located within the larger Yakima Valley AVA, right next to Horse Heaven Hills AVA. 15-plus wineries are located within Red Mountain AVA and many more supply grapes to wineries that source their grapes (think of the Woodinville wineries- they mostly source their grapes from other growers around the state). Red wine grapes like Cabernet Sauvignon, Merlot and Syrah grow especially well here and the Red Mountain wineries consistently win critical acclaim. “Red Mountain is typically Washington’s warmest growing region with broad, southwest-facing slopes and daytime growing season temperatures that average 90 degrees Fahrenheit (32° C). It has an arid, desert climate, receiving an average of 6 to 8 inches (15–20cm) of rainfall annually. Irrigation is therefore required to grow vinifera grapes. This micro-climate really is, for Washington, the ideal place to grow Sativas. Heirloom Sativas are generally found in geographically areas between 0- and 30-degrees latitude, however, the equatorial zone of -10- and 10-degrees latitude provides the most ideal Sativa growing conditions. Temperatures and climate play a huge part of this, but it’s important not to underestimate the effect of daylight hours. In the Northern latitudes, daylight hours can vary significantly across the year. 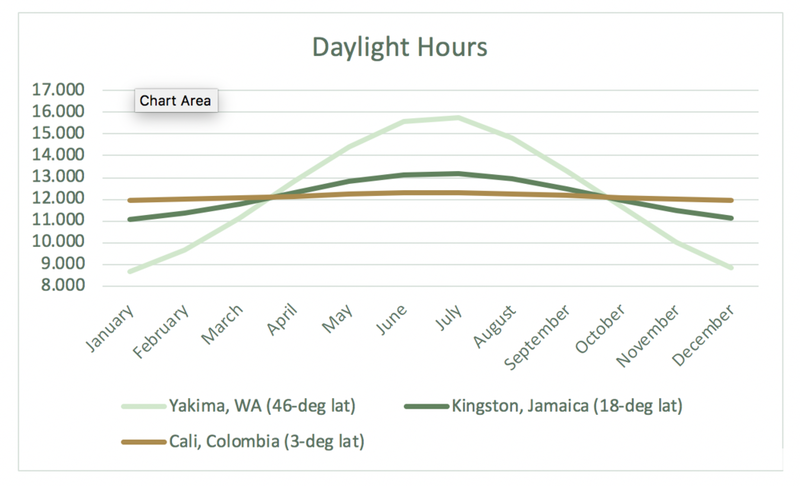 Closer to the equator, the daylight hours are much more consistent throughout the entire year. Washington’s southern border is at 45 degrees latitude which does not make it natural Sativa growing climate, however it is the best region in Washington to grow Sativas. There are many steps you can (and that Kiona does) to more closely simulate the climate of the equatorial zone. Naturally, cannabis plants respond to the daylight hour changes by pushing from vegetative growth into flowering growth when summer turns to fall and the daylight hours dwindle. In the equatorial zone, the lack of fluctuation allows the Sativa plants to continue a very long vegetative growth, sometimes double that of Indicas. This extra veg time plays a part in the massive height of Sativas- you may have seen (or if you’re very lucky, walked through a field of) 20-foot cannabis plants- these were most likely in equatorial zones. In the gardens, John’s goal is to create ideal natural growing conditions using minimal resources while creating a positive impact on the environment. This is where the use of permaculture is fantastic. Permaculture allows a farm to improve their soil year after year by introducing beneficial supplement or companion plants. The detrimental effects of monocrop growing commonly used with corn, soybeans, and wheat can be avoided as the companion plants are chosen based on what they provide the soil. It’s an incredible process, one that really must be seen to be appreciated. It was awesome to walk down the rows of hoop houses checking not just the cannabis plants, but all the other low lying plants around them. From our perspective, it sure seems to be working! Growing these large Sativas also poses a challenge of harvesting them. When you have a group of hybridized cannabis plants cloned from the same mother plant, you can expect them to all mature at mostly the same time, or at least within a few days of each other. With these Sativas however, they must be individually inspected and harvested at their ideal maturity. In the same row of Sativas, they can vary in maturity by weeks. It takes that much more attention to detail for perfect harvests. Late season sagebrush blooms near the rocky cliffs outside Benton City, Wa. Based in Benton City, Washington, Kiona is a Tier 3, state-licensed producer/processor specializing in vintage, rare and exotic strains. Our mission is to perpetuate the genetic diversity and broadest range of desirable effects in traditional and modern Cannabis. Our sustainable, artisanal growing methods begin with a naturally cultivated native soil ecosystem and finish with a connoisseur slow cure. The results are hailed as some of the finest on the market. Newer PostNovember 2nd-4th: Anniversary Sale!